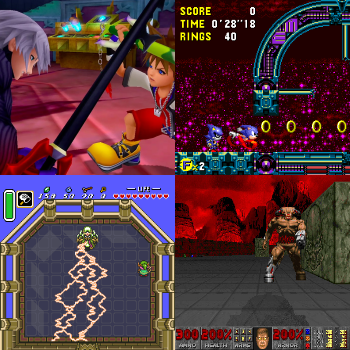 It won't be your last fight, but you'll be fighting like it is.note Clockwise from top-left: Riku, Metal Sonic, Cyberdemon, Agahnim. Boss fight usually occurring after a major revelation in the plot (e.g., about 2/3 into the game). Usually notable for being a long and difficult battle... that is, if it's not a Hopeless Boss Fight. In a game which has only one battle music for normal battles and one for most bosses, a climax boss may have its own unique battle music, a distinction otherwise reserved for a Final Boss. Note that to qualify for this trope, the boss must be at least somewhat of a challenge; if they're a complete pushover, that's Anti-Climax Boss. However, the boss fight does not have to be overly difficult, and a particularly difficult boss fight does not qualify as a Climax Boss unless it comes at a climactic point in the plot. Final Bosses also do not qualify, nor do bosses fought very close to the Final Boss; ideally a Climax Boss would take place somewhere around the two-thirds or three-quarters mark, not nine-tenths. Not to be confused with Pivotal Boss, which is literally so. Contrast Anti-Climax Boss, That One Boss, Final Boss. Inversion is The Unfought, where this kind of battle is set up, but never happens. It isn't usually required to beat them in Orgasmic Combat. Nightmare in Metroid: Fusion, who was foreshadowed throughout most of the game. Other M retroactively makes it even more of a Climax Boss, as it's revealed Samus encountered it before. In most other Metroid games, Ridley usually fills this role; in that he is usually the third or second-to-last boss in the game, guarding away the final level. In Super Metroid he is the last of the four bosses to be fought to unlock Tourian where Big Bad Mother Brain resides, in Metroid Prime he is fought directly outside the crater where the titular Metroid Prime is in, and in Metroid Prime 3: Corruption he is first fought very early in the game, but then comes back as the final Leviathan guardian to be fought before Samus travels to Phaaze, the source of Phazon. The only notable exception to this is Metroid: Samus Returns, where he is the Final Boss for the very first time in the series. It helps that Ridley is also usually the hardest boss in the games. The battle with Frenzied Toroko mixes this with a heaping helping of Player Punch for even more of a dramatic effect. The Core fight, which comes after a minor plot revelation and is followed by a more important one. Plus, it's got its own BGM track, loads of creepy atmospheric build-up, and is followed by both a Player Punch and a fork in the road. Castlevania: Symphony of the Night has Richter Belmont. Castlevania: Dawn of Sorrow has the second battle with Dario Bossi, as well as Aguni if a certain soul is used. Castlevania: Portrait of Ruin has the second battle with Stella and Loretta. Castlevania: Order of Ecclesia has two: Albus and, if on the path to the good ending, Barlowe. The wizard Agahnim, in The Legend of Zelda: A Link to the Past. Link only thought he was the Big Bad. Phantom Ganon and Twinrova fill this role in The Legend of Zelda: Ocarina of Time in different capacities. They are typically the first and last adult bosses respectively. Phantom Ganon's second phase is a preview of the fight with Ganondorf, and he contacts you at the end of the fight to taunt you. Twinrova are Co-Dragons to Ganondorf, and are more active before their fight than any other boss. In Oracle of Ages, you fight Veran-possessed Nayru 3/4 of the way through the game. Veran then possesses Queen Ambi and continues her Evil Plan to build the Black Tower to the heavens. Helmaroc King in The Legend of Zelda: The Wind Waker. It being the kidnapper of Link's sister, Aryll, as well as having kidnapped other girls and overall terrorizing the Great Sea. But it's only Ganondorf's second-in-command. Zant from The Legend of Zelda: Twilight Princess fills much the same role, complete with a Boss Rush in his battle before a crazed and desperate finale. Byrne fulfills this role in The Legend of Zelda: Spirit Tracks, unique theme and all. The last of three fights against Ghirahim in The Legend of Zelda: Skyward Sword. He was active in impeding Link's progress and trying to kidnap Zelda, and his final, desperate fight is the last thing you need to do before facing off once and for all against the real Big Bad. Yuga is this in The Legend of Zelda: A Link Between Worlds, appearing in Hyrule Castle as a boss with a very similar backstory and battle to Agahnim in A Link to the Past. It's after he's defeated that Link actually learns about Lorule and the captured sages. The "White Assassin" in Mirror's Edge is actually the only actual boss fight in the game. The after-fight cutscene also makes it the Wham Level. Ōkami has two Climax Bosses: Orochi and Ninetails. Both brings a new revelation: Orochi's death causes all the other bosses to be let loose upon the world, and Ninetails reveals the existence of Yami. Batman: Arkham Knight has the Arkham Knight fighting you in an excavator and then the stealth duel with him immediately after. It's also the only classic "hit their weakpoint three times" boss in the game. NiGHTS: Journey of Dreams: In Will's story, Reala fights NiGHTS after revealing the latter was actually a Nightmaren all along. The final battle with the Blood Ark in Another Century's Episode 3, at the end of the middle stage of the game. While it is a battle against the Final Boss pilot, and it has the first use of a specific boss battle theme, it is almost laughably easy, since your forces have been getting upgraded, and the villain is using the same mech he had at the beginning. The climax comes from the removal of his unusually obscuring mask which averts Paper-Thin Disguise. Darth Vader in The Force Unleashed. In the Wii/PS2 version, the second duel with Kento Marek, aka., Galen's father may count as well. And for the DLC, OBI-WAN KENOBI AND LUKE SKYWALKER! Several in Asura's Wrath. Each of them is an episode all on their own, or at least have a fight that lasts most of the episode. The fights against Yasha, Augus, Olga's fleet, and Wrath Asura are probably the best examples. The fourth and final battle with Prince Vorkken in The Wonderful 101. He turns out to be the one at the last Super Reactor, and he even killed the Geathjerk officer that would have attacked the Super Reactor offscreen, showing that he's no longer fully loyal to anyone anymore. He is fought right after Immorta gives his backstory, and right before The Dragon Gimme is introduced, two major turning points in the game that mark its Cerebus Syndrome. The first Shredder fight in Teenage Mutant Ninja Turtles IV: Turtles in Time. Once he's defeated, the actual time-travel part of the game begins. Ninja Gaiden II (the original NES version) has a climax boss in Ashtar, who we initially believe is the Big Bad behind the game. Ryu defeats him about halfway through the game, but the threat posed by the Dark Sword of Chaos isn't over yet, and the true Big Bad turns out to be Jacquio, who you defeated in the very first game, and who has revived himself using the Power of Evil. The same Final Boss music is used for both major battles. Subverted in the original game. Not only were there not a lot of actual boss fights (plenty of big mooks though), but most of them every last one of them except Ares seemed to just randomly appear out of nowhere. The Prophet of Regret, unless you just jump on his chair and punch him in the face, then he's a textbook Anti-Climax Boss. The Heretic Leader is another example, although he's only the first boss, he's the hardest of the three, at least on Legendary. Legendary co-op turns all the boss fights into That One Boss instead. The Heretic leader becomes the easiest because if you get lucky, you can assassinate him in one hit. The Prophet of Regret is a absolute nightmare (you have to watch out for his teleporting chair. If his giant laser (one shot kill) doesn't get you, the grenade spamming grunts will. If they don't, then the elites (both dual wielding plasma pistols AND using swords) sure will. On top of that, if you are skilled/fast/lucky enough to survive all three, your partner had better damn well be too. The final boss almost seems EASY after that. In Halo 3, the Dual Boss against two Scarabs and the assault on the Citadel can count. On the other hand, Truth is hyped up to be this, but he just gets killed by the Arbiter in a cutscene. Strife has The Programmer. Most of the game to this point had been preparing to storm his castle. During his fight, you are introduced to The Sigil and spend the rest of the game collecting its components from his colleagues. Yuma in Far Cry 4 provides the game's only proper boss fight. The Cyberdemon in Doom. It was even featured on the sequel's cover! Lazarus Malkoth in Dark Watch is a rare example where the Big Bad qualifies as this trope instead of being the final confrontation. He is fought at the start of the story's final act when the main protagonist's lover Tala turned traitor and allowed his forces to invade the Darkwatch citadel. X vs. Zero in Mega Man X5. This battle is built up by four games' worth of storyline (even included in a prophecy, or something close to one for a sci-fi series), gives genuine conflict to the characters involved, and one of their deaths brings about the end of the series (supposedly). The awesome battle theme cements its status as one of the best battles in the X series (some say even the entire Mega Man continuity). The Egg Viper in Sonic Adventure. To a degree, the Egg Walker too, but it's pretty easy. E-101 Mark II qualifies as well, and possibly Alpha/ZERO. They each get their own unique themes and act as the final bosses to their side-stories. E-101 Beta Mk II also comes straight after a Wham Line clarifying the playable character E-102 Gamma's Foregone Conclusion (after destroying Beta, he himself is his remaining target)..
To a degree, the Sonic and Tails vs Gamma character battle. While it's a pathetically easy boss on any side, it occurs just after Gamma's Pet the Dog moment rescuing Amy, leading her to stand up for him and break the fight up, finalising his HeelFace Turn. The 3D Mario games have Bowser or Bowser Jr. fights throughout, unlocking new levels after each one. While Sunshine followed a somewhat different formula, the Climax Boss was Mecha-Bowser, which is followed by the reveal of Shadow Mario's identity. It's Bowser Jr. In a way, Ludwig von Koopa serves as one for Super Mario World: he's the fourth of the seven Koopalings and the only one whose attack pattern isn't recycled, and he guards the bridge that connects Dinosaur Land's two major continents. In Super Mario Odyssey, this honor falls to the Ruined Dragon encountered between the Luncheon Kingdom and Bowser's Castle. It's barely foreshadowed or explained but makes up for it by being a truly memorable boss: a massive, realistic-looking dragon that looks like something out of Dark Souls, fought in a crumbling ruin with a similarly dark fantasy style. Kirbys Return To Dreamland gives us Grand Doomer, whose defeat triggers the completion of the Lor Starcutter and the group arriving at Halcandra. Klonoa: Door to Phantomile and the Wii remake has Ghadius's Dragon, Joka/Joker. After dealing with him for the majority of the game, and witnessing him murder his grandfather, Klonoa's battle with Joka serves to signal the beginning of the endgame, opening the path to The Very Definitely Final Dungeon. Klonoa: Lunatea's Veil has Cursed Leorina (Leorina transformed by the power of Sorrow), also serving as the Disc-One Final Boss. Defeating her reveals the existence of the true Big Bad of the game, and allows Leorina to go through a HeelFace Turn and join forces with the heroes. Spyro: Year of the Dragon gives us Scorch, the boss of the penultimate world, Evening Lake. The cutscene before the fight gives a major plot revelation: The Sorceress is NOT a Well-Intentioned Extremist, which she reveals to Bianca. Bianca, this Not Being What She Signed Up For, finally performs her HeelFace Turn. Anyway, the Sorceress needs a "Monster to End All Monsters" so she takes one of her minions, as she and Bianca have done twice already, but this one is unique. Unlike previous times, this minion is frightened and needs to be pushed over by his partner. Also, you don't see the boss in the cutscene this time. Then, we get to the actual fight, in which Bentley tells Spyro that the Sorceress is going to use Scorch to crush her enemies, starting with them. The fight is fairly challenging, though many cite it as easy. The reason is that the previous boss is considered by many to be one of the hardest fights in the game, and an optional mini-boss in a recent level is considered to be one of the most annoying. Despite being the penultimate boss, Metal Sonic serves this role in Sonic CD. Prior to this point, Metal kidnapped Amy Rose and changed the past to help Dr. Robotnik rule the future, leaving Sonic to spend the entire game undoing his actions. When Sonic finally confronts him, they duke it out in a style of Boss Battle previously unseen in this series, racing, along with appropriate music .note The former plays in the PAL region, the latter in the NTSC region. This race concludes with Sonic finally rescuing Amy and defeating Metal, with only Robotnik left to oppose him. It's arguably the most memorable moment of the game, as well as the most challenging. Metal Sonic serves this role again in Sonic Mania. Though he's still the boss of Stardust Speedway, this time it's halfway through the game (Zone six out of twelve) and he heralds the point where Mania stops playing around and starts getting serious. His battle is much longer than the previous bosses, has four phases, and Metal himself is only vulnerable at specific times during the fourth phase while you're being chased by a wall of spikes. And like in CD this climax is accompanied by an amazing remix of the Japanese theme from CD. Tiamat in La-Mulana is the guardian of the Dimensional Corridor, the highest-"numbered" front-side area in the game, and is known for having life-creation powers second only to the Mother. It is likely the player will fight her last out of the area guardians or at least close to last (there's no rigid order in which the bosses have to be slain). However, the player still has a few major objectives after defeating her even if all other area bosses are killed, most notably unlocking the True Shrine of the Mother, with the defeats of all eight area guardians being key to that process. Several in Copy Kitty due to the game's length being extended several times over its development, including the swordsman Arikan, the Humongous Mecha Fortress Virs and Giga Dengrahx (all of whom were formerly the game's Final Bosses,) and Yoggval, a Recurring Boss throughout the game who eventually gets taken over and powered up into a final battle as Phoenix Yoggval. Purge the King from Space Channel 5 Part 2. In Rhythm Thief & the Emperor's Treasure, Raphael starts learning that Napoleon has plans greater than simply unleashing his minions and stealing things. His investigation takes him to the courtyard in Versailles—where Napoleon himself shows up and challenges Raphael to a duel. They both live to see another day, but the game gets considerably darker and more serious from his duel onwards. Seymour Natus in Bevelle and later Yunalesca in Zanarkand in Final Fantasy X. In Final Fantasy IV: The After Years after the revelation that despite Fusoya and Golbez successfully killing the Mysterious Girl she won't stay dead, the moon's crystals are all shattered which results in the resurrection of Zeromus with only Goblez and Fusoya there to stop him. Fans of the first game will immediately know how overwhelmingly fucked they are. Saturos in The Broken Seal, albeit far earlier than is the norm for this trope (barely a quarter of the way through the game, maybe even less if you accidentally went straight to Imil from Bilibin instead of going to Kolima first). Agatio and Karst in The Lost Age, which incidentally is the only boss fight you're allowed to lose. Blados and Chalis in Dark Dawn cap off an entire Climax Dungeon. Given that you completed your original goal (obtaining a roc feather) just before entering the dungeon in question, this probably doubles as Disc-One Final Boss as the only real hint that you're not nearing the end of the game is that you've only just reacquired your sixth party member and there are supposed to be eight of them. The fights against Dragon-Maleficent and Possessed!Riku in Kingdom Hearts I. Chernabog may also qualify, as he directly preceds the Final Boss. Kingdom Hearts: Chain of Memories has three of these. Vexen serves as the first one in Sora's story, in which he is the first Organization member to be rematched, and right in the middle of a Wham Episode; he is also the first to be killed off. The rematch with Larxene is the second one, as it occurs right after the biggest revelations in the plot. In Reverse/Rebirth, this role is given to Zexion, despite being The Unfought in the Game Boy Advance version: he attempts to trap Riku in an illusion, only for this to backfire when Riku stops fighting with his inner darkness and finally embraces it; he is also the last Organization member in the game (but not the series) to be killed off. Kingdom Hearts II doesn't have a traditional Climax Boss, but instead a Boss Rush through Xigbar, Luxord, Saix and Xemnas in his regular form prior to the Final Boss. In the Final Mix version, Roxas is added to the start of this Boss Rush. Data-Sora's Heartless in Kingdom Hearts coded, who seems to be the last boss in the last chapter, but there is in fact another chapter and another boss waiting after him. Kingdom Hearts: 358/2 Days has Saix, who had served as the closest thing to a Big Bad the story had and is finally fought when Roxas makes his pivotal decision to leave the Organization. Some argue that Xion, who is the penultimate boss, also qualifies, while others consider that to be the real Final Boss since the following one is almost impossible to lose to and is only the last boss due to being a Foregone Conclusion. Master Eraqus for Terra's story in Kingdom Hearts: Birth by Sleep. Also, the final bosses of all three story modes might qualify since there is a True Final Boss for the game in the Final Episode unlocked after completing the three story modes. And even THAT boss becomes another Climax Boss in the Final Mix version, which adds one more bonus storyline ending in its own final boss. In Kingdom Hearts 3D, Sora has Xemnas, who appears to drop bombshells about the Organization's purpose and ends Sora's storyline but not the game. Riku has Xehanort's Heartless, and the teenage Xehanort. The last one is arguably more challenging than the final boss, who is fought after the villains' main plan is already stopped. It originally wasn't supposed to be in the game at all, which would explain the lower difficulty, as the prior Climax Boss was supposed to be the Final Boss. Similar to Kingdom Hearts II, there is no single Climax Boss in Kingdom Hearts III, instead being a Boss Rush through Luxord, Larxene and Marluxia, Riku Replica and Xigbar, Vanitas and Terra-Xehanort, Xion and Saix, and Ansem, Xemnas and Young Xehanort prior to facing the Final Boss. Breath of Fire 3 had Garr, the Dragon-slayer at the end of Angel Tower, and the Dragon Elder much later in the game. Mario & Luigi: Superstar Saga has Cackletta's first fight about halfway through. Unusually for this trope, you face the Big Bad at her full power and not only soundly defeat her, but also completely foil her plans and leave her at death's door. The second half of the game instead has her working to regain her power while devising a new plan. Mario & Luigi: Partners in Time has Petey Piranha, who has considerably more health than the previous bosses and whose defeat signifies the (apparent) rescue of Princess Peach. Bowser Jr. and his paper self are this in Mario & Luigi: Paper Jam. Paper Mario: the Thousand Year Door has Magnus von Grapple 2.0, who is the [[The Dragon/the Dragon]] to the main villain, is a recurring boss, is fought in the main villain's hide out after so much hype and build-up, and some of the highest stats in the game, only being beaten out by a few other bosses. Marquess Darin of Laus and Sonia Reed in Fire Emblem: The Blazing Blade. The latter is, bizarrely, completely optional. Fire Emblem: The Sacred Stones has: Tirado, Carlyle (Eirika's route), Vigarde (Ephraim's), Orson, and Lyon. The Black Knight/General Zelgius from both Fire Emblem: Path of Radiance and Fire Emblem: Radiant Dawn. Fire Emblem Awakening has three, each accompanied by a common boss battle theme: Gangrel at the end of the first act, Walhart at the end of the second act, and Validar just a few chapters before the end of the game. Fire Emblem Fates has three, depending on which route you're playing, all against someone the Avatar cares for. In Birthright, it's Xander who forces the Avatar into a final duel after Elise is killed defending them from Xander's attack, but it's really so he can commit Suicide by Cop by letting the Avatar kill him. Conquest has Ryoma who has just been led to believe that the Avatar has killed Hinoka and is overcome with rage; unlike Xander in Birthright, Ryoma really is fighting to kill his sibling though he'll wait at least twenty-five turns before he makes his attack. Revelations meanwhile has Gunter, after his status as The Manchurian Agent for Anankos and the murderer of Scarlet is revealed and he attacks the Avatar's forces with an army of Vallite soldiers. The first two are also examples of duel bosses since Xander and Ryoma will separate the Avatar from their forces for the fight (though it's possible-almost mandatory in Ryoma's case-for them to reach the Avatar in time). In Dragon Quest VIII, there's Marcello, which really starts ramping up how bad the Big Bad is making things once Marcello is beaten. Jenova:LIFE in Final Fantasy VII could be seen as one, even though the fight itself isn't too difficult. However, Hojo at the end of Disc 2 would fit the description most accurately, being late in the plot, being an Act Boss, and also giving his own revelation before going into battle. Both of the first actual confrontations against Exdeath in Final Fantasy V. Also unique that both of them have a unique battle theme. The battle against Luca Blight in Suikoden II embodies this trope, especially since you have to beat him three times in succession, then duel him with the Hero afterwards. Both battles with Edea in Final Fantasy VIII, and later the battle with Adel. Garland AND Kuja in Final Fantasy IX. Final Fantasy XIII has a whole series of Climax Bosses, the Eidolons. They appear for each party member when they cross their Despair Event Horizonand typically mark the point where the characters begin overcoming their Fatal Flaws. As for the overall plot, there's the first battle against Primarch Dysley, a.k.a. the fal'Cie Barthandelus. Each boss battle with the Big Bad Smithy's weapon based minions in Super Mario RPG: Legend of the Seven Stars. Also, Punchinello for being a stand-in to the weapon fight. Tales of Symphonia loves these. Not only does it have a bunch of them, it likes to spring them on you in groups: three climax bosses in a row, one of whom is all but unbeatable: Remiel, Kratos, Yggdrasill; two in a row: Pronyma, Yggdrasill; two in a row: Kratos, Origin. Tales of Symphonia: Dawn of the New World has Commander Brute, the apparent leader of the Vanguard and Marta's father. Tales of Legendia has Vaclav, after which point the true face of the game starts getting turned on its head, the invasion subplot is dropped, and the story focuses more on an Apocalypse Maiden. Tales of Vesperia has Barbos for the end of Part 1 and Alexei for the end of Part 2. Tales of the Abyss has Van. While the party defeats him, it's a fake ending. Tales of Graces continues the tradition with Emeraude, who is both this and That One Boss. Tales of Xillia really liked this trope, having not one but four of these, due to multiple characters competing for the role of the main villain. First is King Nachtigal, who turns out to just be the Disc-One Final Boss. Then comes Gaius, who also doubles as an open-ended boss (you can either win or lose). Then comes the battle against Gilland and Celsius, which wraps up of the main conflict of the game up to that point. And finally, the battle with the real Maxwell, which starts off as a Hopeless Boss Fight but then becomes winnable. In Tales of Xillia 2, it's Victor, who's definitely That One Boss. Tales of Berseria has the Hopeless Boss Fight against Innominat, which starts Velvet's massive Heroic BSoD and sets the tone for the second act of the game. In Chrono Cross, there's Miguel. Chronopolis by itself reveals a lot about the nature of what happens when you mess around with time too often; Miguel is just where the story reaches its apex with it. The Hopeless Boss Fight against Lavos. It's actually winnable if you're of a high enough level, but you'll have to go through the New Game+ before you get to that point. And go through New Game+ several times before it ceases to be hard. Magus. In addition to having intense boss music, it's where the true nature of what Lavos has done to the planet and the timelines starts emerging. Vinsfeld Rhadamanthus, Big Bad of the first half of Wild Arms 2, is fought at the transition point between the two halves of the game. Bucks tradition by including major plot points immediately after his boss fight, rather than before. Shadow Mitsuo, the boss of Void Quest. Both in gameplay because he tends to be a brick wall for many players, and in story because the Investigation Team thinks his arrest will bring the end of the kidnappings. It doesn't. Kunino-Sagiri, or as he could also be called, Shadow Namatame. He has kidnapped your little cousin in an attempt to save her (or so he thinks), and at this point in time he is supposed to be considered the true killer. He can end up being the final boss of the game if you go with the bad ending. And on top of all that, he's another stone wall for players. The Old Doll FOE, which counts as this for the third labyrinth. Early on in the dungeon, it's only visible on the map and cannot be actually encountered. Then, it ambushes the player in a cutscene, but you escape. Then comes the last floor before the real boss fight, where it chases you through most of the floor. It will catch you at least once, and successfully trapping it is very much like a climax for that floor, though neither it nor the dungeon are over. Best Friend serves as this for the game as whole. It's fought at the end of what you believe is the last dungeon, it gets its own battle music, is Rei's Shadow, making it the embodiment of all her issues which you've spent most of the game trying to figure out and its defeat leads into a Wham Episode that finally gives The Reveal of Zen and Rei's true natures. Persona 5 features the multi-stage boss battle with the traitor. After the traitor is defeated, The Conspiracy goes into high gear, and the Big-Bad Ensemble is the only real challenge remaining for the Phantom Thieves. Isolde in Mana Khemia Alchemists Of Alrevis. Combined with the awesome song Nefertiti , it's easily one of the best boss battles in the game. And you battle her twice!! Selvaria in Valkyria Chronicles, who stands at the top of a fortress and will rain bullets down upon any fool who's in the open long enough with a BFG. The strategy to defeat her is long and involved and can easily take several retries if you're not careful. Selvaria in Valkyria Chronicles III, because The Nameless is supposed to assassinate Prince Maximilian. Turns out she's the reason why nobody else tried doing this! And then things goes downhill from there, with The Nameless branded as traitors and Gusurg missing, only to turn out to have switched sides. The Legend of Dragoon had roughly one per disc. Disc 1 had Feyrbrand and Graham and Freugal (second time), Disc 2 had Lenus (first time) and Disc 3 had the Divine Dragon. Freugal and Divine Dragon were variations in that a lengthy amount of plot was developed after defeating them that had nothing to do with the bosses themselves. In addition, the final bosses to the first three discs usually had a large plot bomb dropped on the player either before or after the fight. Staying true to the Final Fantasy tradition of making sweet, sweet love with this trope, Final Fantasy XI has several of these. In the Rise of the Zilart expansion, Kam'lanaut in the Stellar Fulcrum. In the Chains of Promathia expansion, Tenzen on the airship. Omega and Ultima Weapons may count as well. In the Treasures of Aht Urhgan expansion, Gessho in Talacca Cove. Though not yet finished, the Climax Boss of the Wings of the Goddess expansion seems to be Cait Sith Ceithir. But considering the bombs they love to drop in every set of missions, the final fight of every mission set seems to be a Climax Boss. Final Fantasy XIII continues the tradition proudly with Barthandelus, the true fal'Cie form of Primarch Galenth Dysley. In the second, third, fourth, and sixth generations of Pokémon, the fights against the leader of the local crime syndicate typically take place immediately before battling the eighth Gym Leader and put an end to the main conflict of the story. In the third, fourth, and sixth generations, the battle against the game's flagship legendary also takes place in the same scenario. The first generation mixes it up as Giovanni, the Big Bad, is the eighth Gym Leader. The fifth generation abandons this formula completely; the leader, Ghetsis, IS the Final Boss. The Eighth Gym Leaders in each game usually qualify, especially considering how much time you're going to have to spend Level Grinding between beating them and tackling the Elite Four. Giovanni is probably the best example from a story perspective, and Claire is probably the best example in terms of difficulty. Pokémon Ruby, Sapphire, and Emerald have another Climax Boss: Norman, the fifth Gym Leader, and the player's father. Despite the fact that his Gym is closest to home, he refuses to fight you until you beat the other four Gym Leaders. During the entire first half of the game, growing strong enough to challenge Norman is the player's primary goal. Beating him allows the player to use the Surf TM, unlocking the right half of the Hoenn region. Surpassing your father is what really gets you noticed by various NPCs. And Norman represents a massive spike in difficulty compared to the other Gym Leaders. The remakes makes this even more apparent by adding particular focus on Norman's battle and its aftermath, wherein he sees you off as you and Wally set out for the other half of Hoenn and he even smiles at how proud he is at you surpassing him. Pokémon Sun and Moon has both battles against Lusamine; the first one at Aether Paradise after learning she's Lillie's mother and her idea of "protecting" Pokémon is to cryogenically freeze them, and the second one in Ultra Space after she's fused with the Ultra-Beast Nihilego. Pokémon Ultra Sun and Ultra Moon has the second battle with Necrozma, having transformed into Ultra Necrozma, which occurs before the player's final Trial and takes the place of Motherbeast Lusamine from the original games. Faced at Level 60 at a point when Trainers' Pokémon are in the low 50s, it's easily the strongest Pokémon in the story. And that's without accounting for a diverse movepool, an Ability that makes super effective moves hit harder, an aura giving it a +1 boost to all its stats from the start, and stats eclipsing those of Arceus. Radiata Stories features a branching storyline that ultimately sees the main character on one side or the other of a war. Each side has Jack visiting the Fire Dragon's volcano approximately 3/4 of the way through the game, though; in the Human Path Jack attacks and slays the Fire Dragon, while in the Fairy Path Jack tries to prevent the Fire Dragon's death, fails, and engages in a Hopeless Boss Fight against Cross. The first game has the two battles against Gemini Spark, with the first battle resulting in the story taking a darker turn and second battle signaling the beginning of the endgame. The second game has the battle against Rogue at the end of the Bermuda Maze, representing the clash between his and Geo's philosophies. Defeating him allows the bad guys to take the OOPart from Mega Man and set their plan into motion. The third game has Dread Joker. The fights against Jack Corvus and Queen Virgo inside Meteor G could also count, though they're both directly before the Final Boss. Skies of Arcadia features quite a few. There are two Hopeless Boss Fights against Ramirez, and the fight against Galcian's fleet and Galcian himself near the end. The fights against the Gigas and the other Admirals, whether in their ships or in hand-to-hand combat could count. AdventureQuest Worlds gives us the Lords of Chaos, who are all Climax Bosses save for Discordia (who wasn't really a Chaos Lord) and Kimberly (other than the health bars which players on all servers worked to get their health bars down to 0 during the One-Eyed Doll Live Event, although Kimberly had the ability to heal the health bar a few times). There's also quite a few non-Chaos Lord bosses that have special challenges for fighting them. Escherion: While the Staff of Inversion is alive, Escherion does not take any damage. Vath: If you attack Vath first, Stalagbite will stomp the whole party to death for massive damage. If you attack Stalagbite first, your damage is significantly reduced when attacking Vath. Kitsune: He'll shapeshift into a giant Kitsune that's immune to your attacks for a while. Wait until he reverts back to normal to continue damaging him. Wolfwing: He'll heal himself up to five times per fight, and once his HP drops below 10,000, that's where he starts going berserk. French Horned Toadragon: Every once in a while, the toad will use an attack that petrifies as many players as it wants for at least two attacks. Ledgermayne: Every once in a while, it will stop to charge up a powerful attack. Enter the glowing safe zones that open up when this happens to avoid damage. The safe zones will heal you when you're in them. Tibicenas: He'll steal HP from as much players as possible up to eight times per fight. When his HP hits below 5,500 and he heals for the sixth time, that's where he goes berserk. Ultra-Tibicenas: Same as Tibicenas, except he steals HP more often, goes berserk when his HP hits below 20,000, and, worse yet, petrifies you every once in a while. Baron Luca: As an Expy of Dracula from Castlevania, he, at half-health, turns into his demonic bat form, just like Dracula himself, which deals a bit more damage than his first form. Moganth, Udaroth, Cellot, Zellare , & Desoloth: Same as Ledgermayne, except the damage of their charged attacks is lower and only does about 500-700 damage, and you don't have to enter any glowing safe zones to avoid the attack. Gruaige Baas: She'll petrify you for a few seconds with a laser attack every once in a while, plus, also every once in a while, except later, she charges powerful attacks and hits for about 500-600 damage. Khasaanda: She can sometimes lock your skills for a few minutes when you use them, plus she can forsee all attacks every once in a while and counter them with the same amount of damage you would've dealt to her for a few seconds. Iadoa: Can freeze you in time for several seconds, cannot be stunned, and unless you have either the Chaotic Hourglass or the Dragonoid of Hours in your inventory, he can do a powerful Astral Shift attack that does massive amounts of damage. Chaos Manticore: He can poison you, which does Damage Over Time that gets worse as the fight goes on unless cleansed with the water of the waterfall in the arena, and once you cleanse the poison, you cannot access the waterfall again for about 60 seconds. Lionfang: Has a Damage Over Time effect similar to that of his Beast, only there's no way to cleanse the effect. In addition, his Essence Draining attack puts the stun on you for several seconds and cuts your damage and healing in half. Mega Man Battle Network 6. Colonel, MegaMan's former ally in the previous game, who MegaMan refuses to fight throughout the game until he realizes that words cannot get through to him. Among his new attacks is a finishing move that is used once your HP reaches a certain point. If it connects, you are instantly killed unless MegaMan is equipped with Under Shirt. The Arishok at the end of Act II in Dragon Age II. This victory earns Hawke the title of "Champion". This in turn makes Hawke the most important person in Kirkwall, which forces Hawke to take sides in the Mage-Templar conflict in Act III. Act I: Algus. Ramza figures out that his brothers are dicks. Act II: Cardinal Draclau/Queklainn. Oh my Ajora, the Lucavi are real! Act III has two, back to back. Wiegraf /Velius. The Dark Side Made Him Forget why he's fighting Ramza in the first place. Marquis Elmdore and his bodyguards, Celia and Lettie. Alma is to be the vessel of Ultima. Act IV: Dycedarg, your elder brother/Adrammelech. This is the end of Beoulve family. Baten Kaitos seems to have an affinity for these: the first game has Geldoblame, Kalas, and the final fight with Giacomo, Ayme, and Folon; the second game has Guillo, Shananth, and Wiseman, though the last of those is actually hidden away in a sidequest. Ornstein and Smough from Dark Souls. Epic music, extremely challenging, and takes place in a huge and grand hall. Defeating the pair is the final test before receiving your next major task after ringing the Bells of Awakening. As a general rule of thumb, bosses immediately before alignment lock or as a consequence of choosing your alignment tend to be this. Maia Ouroboros in Shin Megami Tensei: Strange Journey is built up as the last demon in your way of escape and is also the first major boss after the Tyrants. She is also a massive step up in difficulty after the already tough Asura and must be fought twice. If you follow the Law or Chaos routes, there is also Commander Gore. He is regarded as one of the hardest bosses in the entire game, and will restore half of his full HP when you first get it down to 0. Luckily, if you go Neutral, then this fight is avoided, as you are fighting for the good of humankind. On Neutral, the Climax Boss is Zelenin, your brainwashed former ally who guards two of the Mac Guffins necessary to save the world. Uriel and Raphael, Michael, and the fake YHVH in Shin Megami Tensei II. They're all fought sequentially, mark the game's first major climax (these are the ones responsible for everything wrong up to this point, and even get new boss music. After beating them, however, more plot twists emerge and new villains (namely Lucifer, Satan, and the real YHVH) are revealed. The Moirae Sisters take this role in Shin Megami Tensei: Nocturne as the guards of Yuko Takao, who the Demi-Fiend has been looking for since the Conception started. Later, Girimehkala and Sakahagi act as the second Climax Boss fight, with Sakahagi being built up as a great evil power that has to be stopped. In Shin Megami Tensei IV, depending on if you sided with Jonathan or Walter, the Climax Boss is either Lilith or Yamato-Takeru. Lilith has been dogging you since near the beginning of the game, while Yamato-Takeru works for Tayama, the most loathsome character in the setting; the two of them had been the main villains of the game up to this point, and winning this battle resolves their arcs and makes way for the real bad guys, namely the White, Merkabah, and Lucifer. Krishna, leader of the Divine Powers, serves this role, as the threat that the Divine Powers pose is enough to make humans, angels, and demons cease their three-way war as much as they need to in order to stop them. He is fought in Tsukiji Konganji, which he's set up as HQ for himself and his fellow polytheistic gods, and once he's downed, the first three factions go back to being at each other's throats. Then it turns out the Powers all faked their defeats and they proceed with the next step of their plan for humanity's "salvation". After the second of two alignment locks, you either fight Dagda on Bonds as he takes your powers away in revenge for betraying him while Danu tries to make a new Dagda to keep you alive, or all of your partners (except Asahi, who's already dead by this point) on Massacre as they try to stop you and by extension Dagda from carrying out your omnicidal plans to remake the universe. Shining the Holy Ark has you fight Rilix after you learn that the King is nothing but a puppet and that she plans to revive the thousand year kingdom. Oh, and she plans to kill you. Shining Force has the fight against Kane, the Runefaustian general that destroyed the main character's hometown and is given the greatest build-up of all the bosses in the game. He's also one of the toughest, with an extremely high attack proportional to that of the playable characters'. Xenoblade Chronicles: The rematch with Metal Face at Prison Island, approximately halfway through the game. Shulk's Monado is finally upgraded to be able to hurt Metal Face, a number of important characters are either killed off or revealed to still be alive, and the aftermath of the fight completely changes Shulk's motivations going into the second half. In EarthBound, most of the problems in the Eagleland section (Onett to Fourside) was caused by the Mani Mani Statue sent by Giygas. The statue manipulated six people directly and large crowds though them and is finally confronted by Ness and Jeff in an illusion world it created. It's not a defenseless statue, though, and fights back. Destroying it lets everyone in Fourside manipulated by it go back to normal. Except for Pokey/Porky. The first game allows you to come face-to-face with Saren on Virmire, right after you learn the true nature of Sovereign, the starship he's been using to wreak havoc around the galaxy and brainwash people to his will, along with its goals. He possesses powers from all three of the skill trees available in the game and is an example of Heads I Win, Tails You Lose, considering that no matter how much damage you do him he gets away scot-free, leaving you to make a Sadistic Choice on whether to save Kaidan or Ashley when you destroy his base. Mass Effect 2 has the mission on the abandoned Collector ship featuring that game's Big Bad, Harbinger, whom you never directly confront but rather have to defeat his multiple drones which he can Villain Override. This isn't your first time confronting such an avatar, but that occasion falls under Wake-Up Call Boss. This is right after you learn that his plan for an Alien Abduction is considerably larger in scale than believed, and that the Collectors are all that's left of the Protheans. Mass Effect 3's closest equivalent is the fight on Thessia, where the underpinnings of the Asari culture are totally undermined, Kai Leng steals the secret of the McGuffin that you've been trying to construct in order to have any chance of winning or surviving the war with the Reapers, and like in Mass Effect, is another Heads I Win, Tails You Lose. Templar Octienne, the Balor, and Gadflow in Kingdoms of Amalur: Reckoning. Cordelia's dragon form in Child of Light, which happens shortly after a huge revelation (Nox's betrayal) in the game. Her battle music is also different from the normal boss music. All of the trophy bouts in Fleuret Blanc. They always occur at the end of a day and are thus usually in the proximity of an important plot event, and it's (usually) the first time you're able to bout a member. (In the case of Masque, it's also their first appearance.) Gameplay-wise, both Florentine and her opponent have twice as many Hit Points as they do in normal bouts, making the fight longer and more intense. A Very Long Rope to the Top of the Sky has multiple. Archbishop Gebhart and the Judgment are particularly notable, as they mark the end of the childhood arc. The third fight against Rutger also counts, as it involves taking down a long-term villain who presents a major threat to the world. Oliver, fought during the liberation of Avishun, may also count. He isn't a major villain and the battle doesn't coincide with as important a plot event as the other two examples, but it is fairly important (and difficult). All of these get special Battle Theme Music, too. Archos in the single-player campaign of Telepath Tactics. Unlike previous bosses, he is an established character, and one of the major players in the central conflict: this is the first time you're fighting someone directly affiliated with the mining company, rather than one of their patsies. Knights of the Old Republic: Darth Malak, who's also the final boss, is first fought inconclusively right after the huge revelation about what his interest in the Player Character is. Uncommon Time has three, one for each chapter. Though it's a Giant Space Flea from Nowhere, the Winterspirit, fought at the end of Movement 1 immediately after the World Tuning fails, definitely fulfills the role. Teagan, fought at the end of Movement 2. The Herald of Winter, fought at the end of Alto's Vision Quest. It represents Alto's subconscious hatred and desire to destroy the world. If you lose, you're treated to a Non-Standard Game Over where the Herald dominates Alto's personality and ushers in an ice age that will destroy civilization. In Undertale, Undyne is fought at the end of Waterfall, a backstory-dense level which reveals much about the Underground and its history. She will also make explicit the consequences of your chosen playstyle in her pre-battle speech; on a Pacifist route, she mentions her surprise that a human would be so non-violent and mock you for it, on the Neutral route, she'll remember the names of all the monsters you've killed (changing her speech entirely if you've killed Papyrus), and on a No-Mercy route, after being mortally wounded, she'll realize that you're out to kill humans and monsters alike, transforms herself into Undyne the Undying, and give you your first real challenge of the run. Dark Lord in Final Fantasy Adventure and its remakes. After Storming the Castle, you finally confront the Big Bad. Only to realize The Dragon, Julius has played you and Dark Lord for fools and completed Dark Lord's plans without him. The Knave of Hearts in NieR attacks the main characters' hometown just as you finish collecting the sealed verses to cure Yonah. You can't defeat it yet, only seal it away. And while you're busy with that, the Shadowlord kidnaps Yonah. The first Digital Devil Saga has Varin Omega and his demon form, Ravana...story-wise, anyway. In the second game, it's Heat's new demon form Vritra, the last real boss fight before Gale and Cielo's sacrifices and Serph and Sera's fusion leading up to the Very Definitely Final Dungeon. Enoch in OFF, the largest and most powerful Guardian in the game's world that is faced right before the Room and shortly after the reveal of what, exactly, the "sugar" the Elsen are so obsessed with is really made of. He is also the first character in the game who explicitly points out that "purifying" a Zone kills almost all life in it and fills it with monsters called "Secretaries." The player does have the option to go back and see this as soon as Dedan is killed, but it is always optional; Enoch finally mentions that something happens to a Zone in his last words. ALLTYNEX OS from Kamui is probably the game's most important boss fight, but there's still the Adjudicator to fight after it. ZODIAC Virgo from RefleX. Ever since this mechanical terror destroyed the Human-Type Cancer, it's inevitable that the player has to fight it later on, resulting in one of the longest boss fights in the game besides ZODIAC Libra. Dread Bomber in Raiden II is the last boss before you go into space, has four forms, and is considerably harder than previous bosses. The penultimate boss of Einhänder, Schwarzgeist. Defeating this boss leads right into the game's Wham Episode. Thunder Force has the Vasteel Original from V, which happens to be the resurrected Rynex from the previous game. The boss theme, "Duel On Top" is a remix of IV's intro theme. Battle Garegga has Black Heart at the end of Stage 5 (of 7), which comes at the end of a stage with a couple revived bosses in between and is by far the hardest boss at this point due to a combination of tricky attacks and having only one part with a ton of hit points rather than a "core" and individually-destructible components like all previous bosses, ensuring that the player can't weaken its attacks before going in for the kill. After Black Heart is defeated, the player then proceeds into the enemy base. The Hind-D gunship, piloted by the Big Bad, in the original Metal Gear Solid. Colonel Volgin and the Shagohod in Metal Gear Solid 3: Snake Eater. The fight against Metal Gear Ray in Metal Gear Solid 4: Guns of the Patriots. Cunningham in Metal Gear Solid: Portable Ops. Assassin's Creed II has the first fight with Rodrigo Borgia. Especially once the other Assassins arrive. Assassin's Creed III has Connor against his father Haytham, mainly since he's a far more effective swordsman than any other enemy in the game and requires a specific move to beat him. He actually feels more like a final boss than the actual final boss. Fossil Fighters does this twice, first with a showdown of Olympus Mons, then against the leader of an alien race of dinosaur people before even learning about the Final Boss. Dishonored has Daud only halfway through the Flooded District, who serves as a Mirror Boss and is far more difficult and personal than any other target in the game. He's not the final target, nor even the last boss in his level, but facing off against him and his assassins (and proving you're better than any of them) is certainly a high point. Hitman: Absolution has both Wade and Sheriff Skurky who act as Co-Dragons to Blake Dexter, both are fought at the end of the most unpleasant levels in the game (Rosewood where Wade killed all of the staff, and the town of Hope being invaded by the ICA), they cap off the first and second arcs of the game, and they are both fought with Point Shooting unlike the other targets (though Wade can be killed by other means). So you've rang the bell tower in Resident Evil 3: Nemesis and Jill declares "it's finally over" as the rescue helicopter descends. Nemesis has other plans: he shoots down the helicopter, infects Jill with The Virus, and it's the first time in the game you're actually forced to stand your ground and fight (either as the sick and dying Jill or as Carlos). Cue a two day time skip, the game is far from over, and now Jill and Carlos are stuck in their Darkest Hour. Silent Hill 2 has Eddie Dombrowski. His boss fight accompanies The Reveal of Silent Hill as a Genius Loci, his death is an emotional turning point for James, and immediately after is the Lakeview Hotel. Galaxy Angel — the first fight with Noa in the Black Moon's core. The Grand Zamboa in Third Super Robot Wars Z: Jigoku-hen because the Anti-Spiral was pretty much the General in charge of this "battalion" of the Ba'al with something like half the villainous series used under his authority. The entire original story practically surrounded what he was doing in the background.In a lot of ways, he was kind of like what the Aerogators were to the entire Balmar Empire in the Alpha series. Everything in the story was leading up to the encounter with the Anti-Spiral. The Lupino Showdown from the original Max Payne, which has Max fighting roughly thirteen mooks that swarm in one after another after him before Jack Lupino himself makes his entrance with two of his personal guard and a sawed-off shotgun. He's also hopped up on drugs and completely insane. Spec Ops: The Line: Right between Lugo's death and Adam staying behind for a Last Stand near the end of the game, Captain Walker has to fight a hallucination of Lugo, who is programmed as a Heavy with far more health. The battle against Kachua, which actually shares its battle theme with the final boss, and where Saki first transforms into a monster. The fight at the end of Stage 6, a lengthy, 3-stage ordeal, ending in a hand-to-hand fight, and ultimately resulting in one of the characters being knocked out, and the other transforming into a monster in order to storm the final level. Skorge in Gears of War 2. Star Fox 64 has the Star Wolf fight on Fortuna/Fichina. The other two fights are fought too late to be considered this. In Hollow Fields, Summer Polanski serves this role with her Death Trap. After two volumes of tormenting Lucy Snow and indirectly threatening her with detention, she makes the decision to go all the way and outright attempt to kill her. Escaping this situation requires Lucy to use the skills she learned up to this point, as well as team up with Claude and act on the fly. She then goes on to confront the Big Bad in Volume 3. In Kill la Kill, Nui Harime is first fought immediately after revealing that she was Isshin's killer. While it's still running, One Piece had this in the form of Crocodile. He's the first major Big Bad the Straw Hat crew encounters after crossing the Grand Line and the first antagonist in the series to actually defeat the main character Luffy in battle, twice. It's this arc and Crocodile's defeat that really kicks off the plot elements that are still present in the series today. Grand King Ghidorah in The Bridge. Nearly everything bad in the series can be tracked back to him in some fashion (he's in part responsible for Bagan in the first place, caused Monster X and the evil Xilians to exist, and a number of other things), and his fight marks the Godzilla family finally mending and uniting together against a single threat. Shane is the main antagonist of the second season of The Walking Dead, as he tries to usurp Rick after losing leadership of the group as well as Lori and Carl's affections to him. The penultimate episode of the season features their final confrontation that resolves their story arc and proves Shane wrong in that Rick is a man who can do what needs to be done to protect his family and friends. King Octávio in Deus Salve O Rei is one of the primary villains introduced halfway through the series and becomes practically the biggest threat of the show if it were not for Princess Catarina being the real instigator of the crisis. He is slain just three episodes before the show ends by Afonso himself and the rest of the story is holding Catarina on trial for her crimes and executing her. This was one of Game Dude's many gripes about Mickey Mousecapade: he gasped in astonishment at how short Pete's level was, and complained that, despite being on the cover art, he isn't actually the Final Boss. In My Little Pony: Friendship Is Magic, in the episode "Do Princesses Dream of Magic Sheep", the Tantabus can be considered this for Luna's Redemption Quest that began in the second episode because she only defeats it by finally forgiving herself for that event and being willing to move on. Two of these are fought in episode "XCVIII" of Samurai Jack. Jack goes on a Journey to the Center of the Mind and relinquishes the anger that has corrupted him for the past 50 years, finally purifying his Enemy Within Inner Jack. Meanwhile, Ashi defeats her mother the High Priestess in a Duel to the Death, finally completing her Redemption Quest and completely escaping her influence.